Secret Recipe serves great Tom Yam Gung. This was recommended by Sayang, who is an ardent fan of their Tom Yam Gung. We've had this plenty of times already at various Secret Recipe outlets. The one we frequent the most is the one at DU, Uptown & Cheras Leisure Mall(CLM). 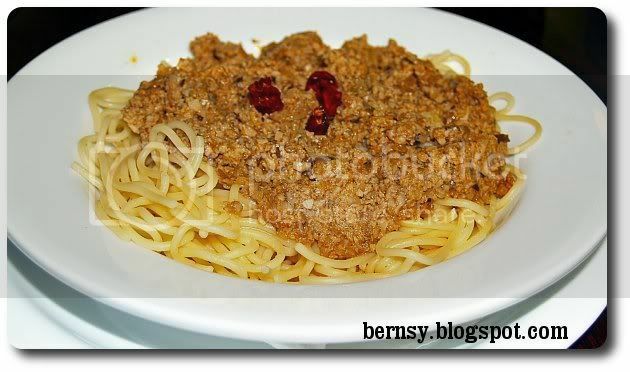 Did you know that in Leisure Mall, they actually are 2 Secret Recipes ? One on each wing. 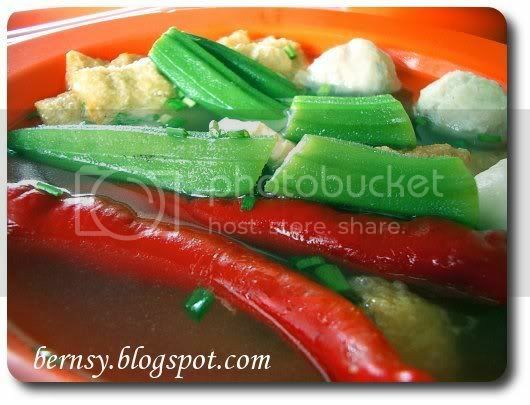 The soup for Secret Recipes Tom Yam Gung is very potent. Definitely not the type of soup for people who can't eat spicy/hot. Everytime I eat this, I am sure to sweat like crazy. And everytime I sweat like that I will complain to the staff that their air conditioning is not working, then they sure gelabar wan. Their prawns are usually big, succulent, and most of all fresh. However, when we had this bowl of Tom Yum Gung, I thought the prawns were slightly smaller than the ones we've had in CLM and the one in DU. I thought they were suppose to be the same. Irregardless of what size those prawns are, Sayang is sure to finish the whole bowl. Its means a lot because she would just normally take half the noodles if she eats elsewhere. Ya its that good. We ordered the set which comes with one Ice Lemon Tea or Softdrink and a Brownie of the Day. As for me, I wanted to try something else. Tom Yum Spaghetti. Its actually not that good, to be honest. Its not even half as good as their Tom Yum Gung. I won't ever order this dish again. Tom yum just not kao enough. Here goes, Brownie of the Day, now comes with a choice. We could choose between a Carrot slice ( why does Secret Recipe think that thats a brownie ?) or a Choclate Walnut Brownie. Of course we'd choose this one. 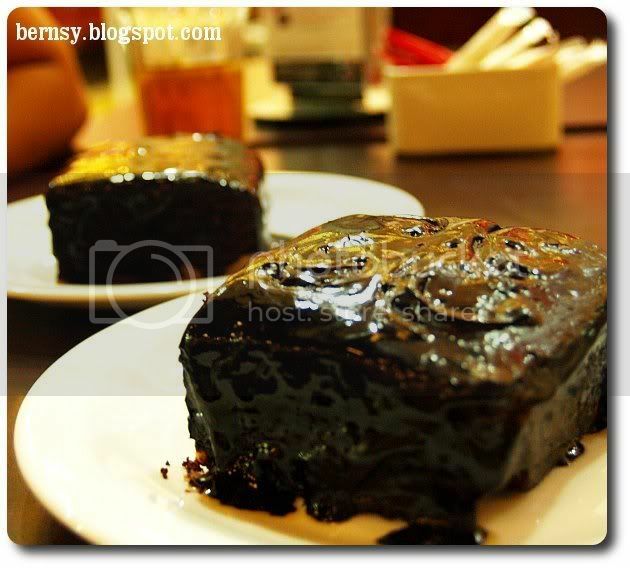 It comes with the chocolate oozing down the plate, and since its warm, the chocolate in the cake is actually liquified, so more Chocolate invades your mouth after you bite into it. Yummy !! The meal was less than 50 bucks for two sets. Usually I won't complain but the prawns were a bit smaller than what we had in other branches. My spaghetti Tom Yum was a dissappointment also. I have tried their Irish Lamb Stew, which was supposedly Award winning too. 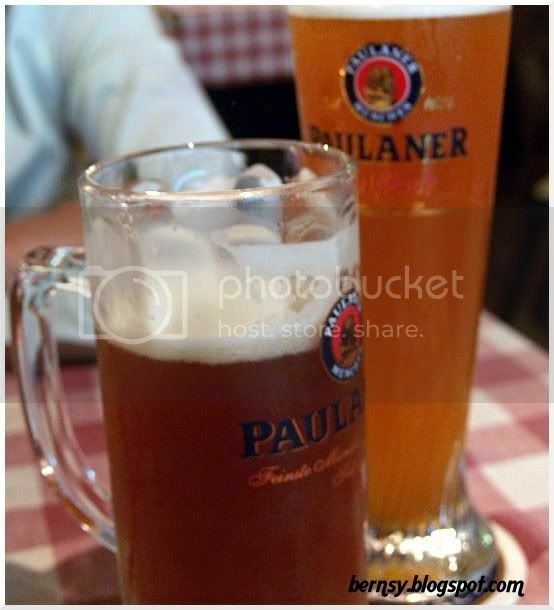 It's quite good, but Sayang said the one in Finnegan's is not bad either. I have been wanting to come to this place to eat for quite some time. Its just that we haven't got the time to come here. So one Sunday we just told ourselves, lets just go and eat there again, so I could blog about this place. What is Cosy Corner famous for ? Well to be honest, I know their Yong Tao Foo is famous, and always 5sen or 10sen more expensive than other shops. Their Lam Mee is good although I have had better (May King @ Jln Yew/Pasar). Their Curry Laksa is very nice too. For me the star of the day is their Curry Laksa. 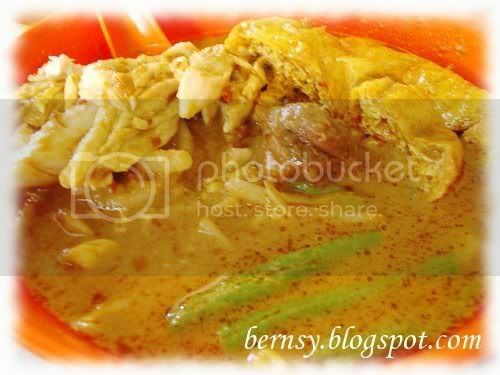 Their laksa got just the right amount of Lemak, and isn't too thick. Just nice , the way I like it. Of course I am not going to compare them with 15 ringgit laksas, which I dare say some even loose to them. 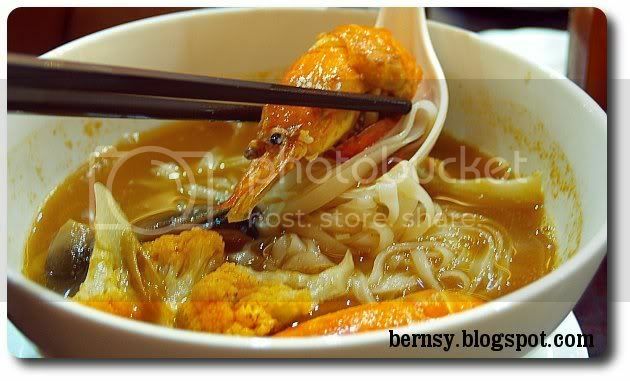 To be frank I have not tried their Prawn Mee before, granting that I have been to this restaurant for countless times over the years. For Directions and Map please click on this link..
A client recommended that we meet at Timor Place in Dagang Avenue. I had no idea what this was, but when I first walked into the cafe, the decor did not disappoint. The interior gives you the feeling you are walking into a modern Malay cafe style eatery. 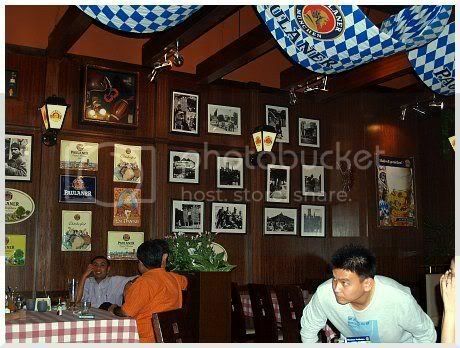 The tables are all covered with nice table cloths and the staff attentive. According to my friend, this is according to him, an artiste's meeting place. I think he meant hang out. So he mentioned a few Malay celebrities, and since I know none of them, I won't recognize any, even if they stood infront of me. My friends met there, having eaten Steak somewhere else. So they were to first to order. They had a dish called "Kunyahs"(14 bucks). I spelt it as it appeared on the menu. Its a plate of fried mushrooms, potato wedges, fried squids and fried something... Then they also give you the kuah cili manis, very nice (authentically done like keropok lekor type of kuah). 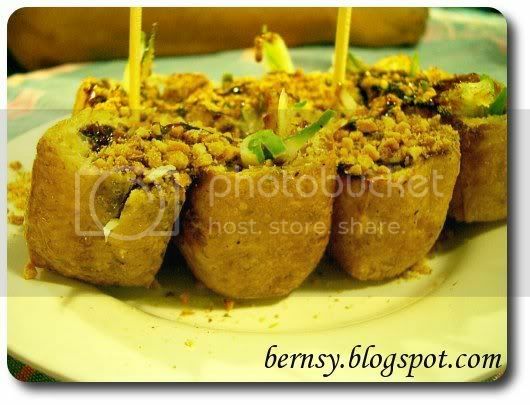 They also asked for 2 servings of Tauhu Bakar. 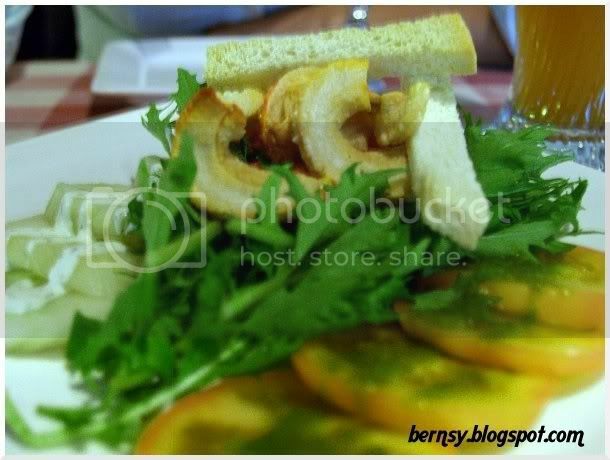 Unfortunately for me, I forgot to change the WB settings on the camera, so the pics here turn out a bit yellowish. They seem to have enjoyed every single thing we ordered. I ordered the Nasi Goreng Timor or Udang (about 6bucks), which was recommended by the boss there. If you remember Nasi Goreng USA, this is similar. 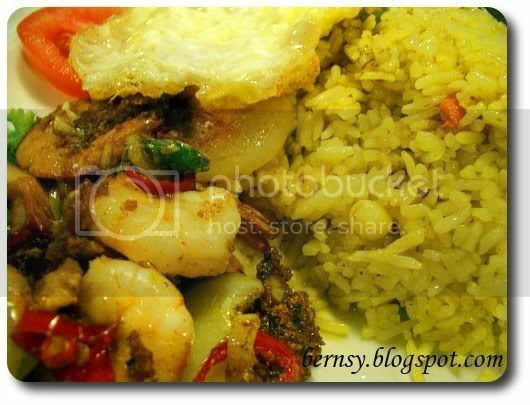 They serve you fried rice , topped with a fried egg, accompanied by Udang Timor. It was a great single serving dish to have, I was impressed by all three dishes we ordered that night. 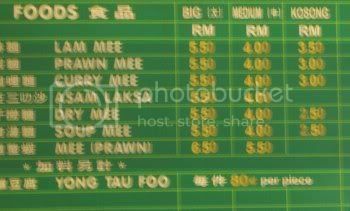 Price wise, this place a bit high la for a Malay restaurant but still it costs less than what you would pay for a bowl of noodles at Secret Recipe.. but slightly higher than Kopitiam pricing. This eatery doesn't give you the stuffy and hot feeling like some restaurants. Although no air conditioning, this place was kept rather cool that night (definitely a plus point for a Malay eatery). WTF is this ? I bet thats the same thing you thought of when you saw the pic. Last week , while Sayang and I were jalan jalaning in Plaza Damas, we stumbled upon Eric Tsang's Deli / Cafe place. 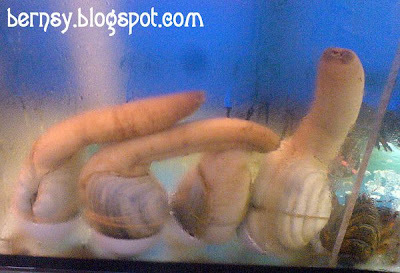 We walked past the restaurant and saw that thing in an aquarium..
Will you eat that something that looks like a LC ? So the hokkien fella sure ask wan, "Hami LC lai geh ? " ROFL !!! This must be the latest addition to The Curve's already long list of reastaurants. Althought I am not sure if the Apartment is newer or not, we noticed this place the day we went buy donuts at the Big Apple. 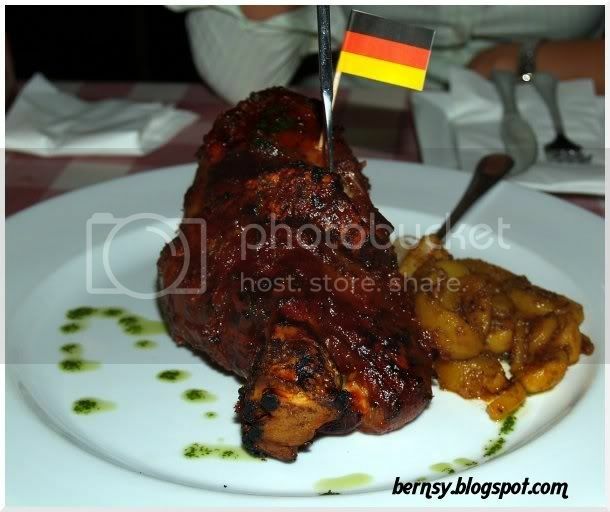 The knuckle came and I thought, I might have seen a bigger serving of pork knuckle somewhere before (Deutche Haus, Changkat Bkt Bintang to be exact). Size abit smaller, but tastewise, I think its consistent with the other outlets that sell them pork knuckles. I haven't tried Mr Ho's version of this dish though. Directions to this place.. the place is located behind TGIF at the Curve. So walk towards Big Apple and when you see big apple Donuts, look around, you should be able to find this place. Would like to come back, but Sayang will complain , I eat too much eat or something like that... kekekeke.. I have been wanting to do this, but did not get myself to do it until just now. I finally put up a blogroll of most of the influential food bloggers list, and will continue to update them as I meet more of you guys. Its essentially gonna be easier for me in the future to search for references, and so forth. A lot of you take very good pictures of food. A lot of people must have been to this place. Because everytime I come here, the stalls are always jam packed. Although its only my second time here, I really wondered, whats so nice about this place? The stall is always crowded during lunch time, all three of them, there is no adequate parking, I mean this place is just not cut out for the kind of crowd that Seri Menanti is pulling in. is just amazing, to watch the amount fish getting grilled at one time over here. It's gotta be a stall that sells the most amount of grill fish in a day. You see the amount of people queuing up for the fish, your expectations floated. I don't see what makes this place so popular, the price is a little steep for a hot , smoky shack kinda restaurant, the fish tastes so - so, and yet you see so many people trying their food... [scratch head]. As for the food, I find it just average. The fish they serve are not of any special kind, nor is it of good quality. What do they serve there ? Ikan terubuk, ikan pari, telapia, tenggiri, Cat Fish, ... I mean some of this fish has muddy taste to it, and my colleague complained his cat fish actually got bau hanyir... ish !! This is where their sambal comes in. 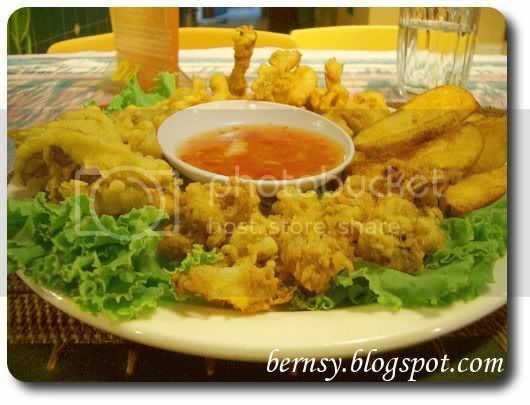 You have to eat them with the sambal, it does a very good job masking the real taste of the fish. Price over here also abit on the steep side for this type of food & environment. Okay, here's something good to say about them. I didn't have to wait too long to get my food, as most of the stuff there is self service. For directions do click on the other reviews. This has got to be one of my favorite places to eat whenever I come down to Kuala Lipis. Unfortunately for me, I am with my malay colleague or with a customer, most of the time I am in Lipis. As such, opportunities to eat here comes only once in a blue moon. To get there, just drive into Kuala Lipis town and you will see it. Its right in the middle of town. Or if you still need help, just drive to a place called Centerpoint, and ask for KFC. What's special over here ? 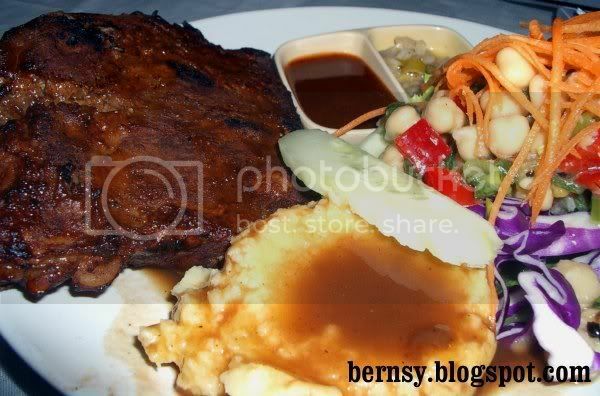 I do not know how they prepare it, but the meat is always well cooked (important), and tender. Usually when we eat here, its only a colleague and myself, just two fellas. So can't order much. The belacan choi Tam (Brussel Sprouts ?) we ordered, came out very nice. 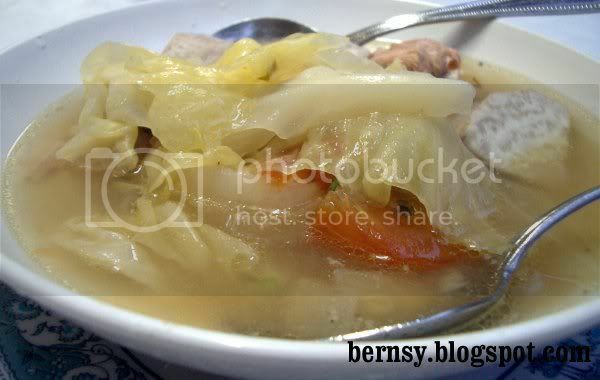 It has got a good mix of good and fresh belacan, garlic, onions, and dried shrimp. The third dish that we ordered was the Telapia. To most of us in KL, this fish can be terrible. I mean this fish can taste like it swallowed a ton of mud, hence the mud taste in the meat. The telapias here didn't give a hint of mud, and tasted quite nice. No fishy smell, thumbs up to the way this restaurant prepares their fish. Everything here tasted like home cooked food. I mean its tasty, the cooks here are not heavy on ingredients like salt, sugar, and MSG. What else can I say, the pricing here is also very very reasonable. I recommend anyone to come drop by this restaurant if you are passing by Kuala Lipis. Since Jenny asked where this place is I might as well put up a map of Kuala Lipis. I pinched it off Hotel Centrepoint's website , which is why the directions actually will lead you to centrepoint. I went back to Spices of Malaysia again. Its a food court located in Mines Shopping Fair@ Sungai Besi, Sri Kembangan, Balakong. a newly renovated food court, with nice new furniture, adequate air conditioning. Important thing is that , it also has got a lot more space, and definitely looks a lot cleaner than the old foodcourt, we used to have to wait for a table now there is ample seats. You can say, its a world apart comparing the new and the old. So what do you do when you see a few chicks hanging around ? For me, my head will turn and then I will go check them out. Wakakaka, you see those chicks hanging around below , lol ! 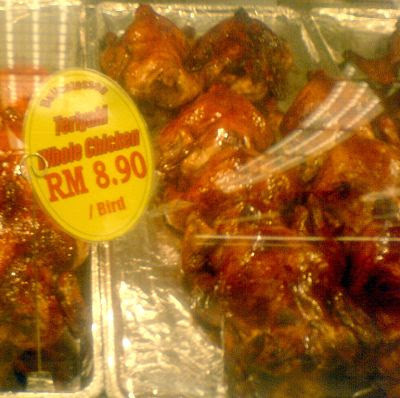 Its a halal chicken rice stall, which means their char siu is also made of chicken. Their siu yuk substitute is Fried Chicken. I circled the stalls of Spices, and in the end I came back to this one. The char siu chicken, looked very inviting. The "fried chicken" rice, also looks damn good. When I walked past, those chicks were practically calling out to me.... I gave in and ordered. This is new to me. This chicken rice stall , can ka liu wan (add stuff). I added an extra egg, and extra vegetables. Its quite important to eat enough fibre. I ordered char siu chicken. If I had a choice, I would have gone for the real char siu, but too bad, this place is halal. Not sure if they have a sign that says it is, but plenty of malay folks come here for lunch. Everything turned out quite good, except that the oily rice could be prepared much better. I only finished half the rice but chowed down everything else. It was Tuesday night, we went for Shade's class in Uptown . After class we asked, where to find food over here ? He suggested to us the Kopitiam right next to RHB Bank in Damansara Utama (Uptown). He is a Group X Instructor who teaches RPM, Body Attack, Body Combat, and err... Body Jam got ah ? He has been doing quite a few demos lately at various shopping complexes, and I managed to capture a short video of him. Although he hardly blogs nowadays, here is a link to his blog. What does an Instructor eat after Class ? Fish Head Bee Hoon, and Lo Bak ( I think that's what it is called). I found the lo bak the stuff on top to be quite okay, nothing to complain really. 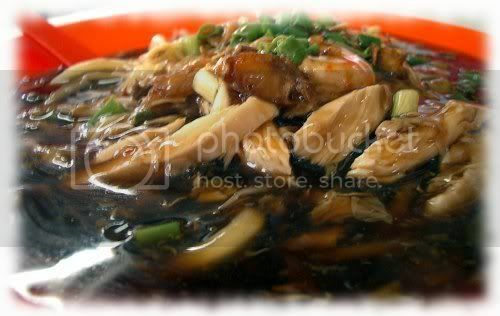 Alvin also recommended the Char Koay Teo, which was done Penang Style. So what does the students eat ? It didn't take too long for the CKT to arrive. I also took a few bites just to test, and found it quite tasty. That was like one of the best CKT's we tried in DU. I mean, if we were to compare it with the Teppan (Flat Grill) CKT, this one sure beat them flat. Sayang happilly finished all of it (that speaks for a lot for someone who eats so little). I ordered a banana leaf hokkien mee. Now everyone's probably tried banana leaf rice before, but banana leaf hokkien mee, this must be some gimmick or something la. Actually the banana leaf was really a gimmick, I don't think it actually contributes to how the noodles tasted. Sayang still preferred her Hokkien Mee @ Online Pub. Oh well I thought this one was quite decent, definitely no complains from me. The lard was not too thick, it was quite sweet, the serving was quite generous for a RM5 plate of noodles, and everything was well cooked. We also ordered satay from one of the stalls, and found the Chicken to be a tad too dry for our liking. But we still finished all of it. This kopitiam is in Uptown, right next to RHB Bank, will come back and update on the Addres later. Its just one of those days, you really have no mood to eat nearby your office. So for lunch I took a 5 minute drive (still nearby) to Jusco Selatan to look for food. Its quite common for office folks to just go tapao food from a food stall, because they lazy to eat outside, or because its smoky, and stuff y in some kopitiams. So instead of walking out and bringing food back, why not just buy food from a Supermarket and bring it back and enjoy them in the comfort of your office (provided ur boss allows it lo). 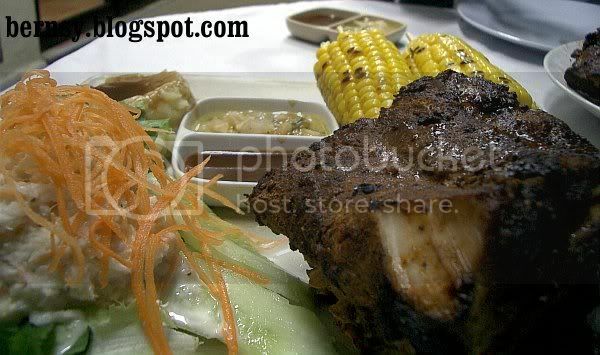 Teriyaki Roasted Whole Chicken, Guava Juice and One Big Apple, all for only RM14. Luckilly for me, by the time I got back, my boss was still around in the office, so he shared the whole chicken with me. Wakakaka, otherwise sure tak jadi want to eat healthy. We just finished gym at The Curve, and wondered, what to eat that night. We walked past TGIF and thought, hey.. don wanna eat too much to night, so we walked on. Then we realized, hey , this donut place has always got a queue, so lets try them. We checked to see if they have tables and seatings for us, the answer was YES and we sat down. While Sayang ordered, I kept busy snapping pics of this place. I am still trying to figure out how to use the new camera.... sigh !!! Okay so this place sells only donuts, unlike Dunkin Donuts, so says Sayang. This is my first time here, and I read this sign they got just outside the store. Buy A cup of Coffee , get a donut FREE !! Whoa, so nice meh ? So I ordered a cup of coffee. So they give you a normal glazed donut. Nothing special there. As for dinner , Sayang ordered a dozen donuts. Most of the time, we shared half a donut each. Notable donuts I liked, were the OREOs, Double Chocolate, The Cheese donut, and the durian donut. Although the donuts were soft and fluffy , I found them surprisingly filling. We finished 7 donuts between the two of us, and we brought the rest back home for Sayang's mom. Her parents liked it so much, they requested us to Ta Pau somemore. Wakakaka !!! The donuts costs about Rm2 each ( for single) RM9 something for half a dozen, and RM17 for a dozen if not mistaken. Even if you don't wanna eat donuts, at least go there have a coffee and wash your eyes. I noticed a few leng luis go there makan and eat coffee also.